Adulting is trying to navigate the partly sunny dirt path that never seems to ends. Being an adult is making huge decisions that will ultimately benefit you ten years down the road more so than the immediate present. Adulting is trying to figure out what classifies as good health insurance. And for that matter, trying to save money while drowning in student loan debt where the total number you owe, visibly, never seems to change. It’s also about making memories, taking wild adventures and “see[ing] the world” while having to (presumably) support yourself almost 100% for the first time in your life. 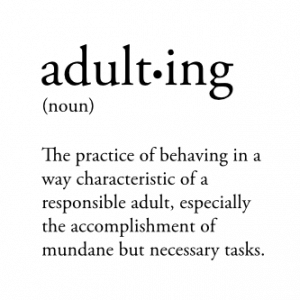 I can’t be the only one who is terribly scared of adulting, right? When I graduated in May, I had this idea of what was going to happen: I would work one last summer at Chautauqua Institution, come back to Ithaca, find a job and save as much as I could just to pay my student loans. Sounds reasonable, right? But as everyone knows, life doesn’t always work out the way we have it in our heads or what we want to perceive. I came back in August and applied to some jobs in Ithaca, nothing. I continued to look online for various jobs in and outside the Ithaca area, nothing. My bare savings was running out, my student loan payments were going to begin in December and I had no job to my name. All my college friends were in Buffalo, finding their own personal success in each of their endeavors and I thought, hey, I can do that. I should be doing that. Why aren’t I doing that? Finding success. I found myself in Buffalo by the start of the New Year. It’s been absolutely insane. I threw away over 7 garbage bags full of trash, clothes to donate, things I had no use for in bags to donate and I headed 121 miles west to Buffalo. I have just enough room in my apartment just outside the city, with access to all shops and stores which are only a two minute drive down the road in all directions. If I want to go to the mall (read: LUSH), it’s at most 15 minutes, depending on traffic. In Ithaca, I would have to drive, at most, 15 minutes to get to the grocery store and over half an hour to get to the gym or post office. If I wanted to go to a larger mall, it would take me almost two hours to head north towards Syracuse. Living closer to things and places is a whole new world. Now, my main reason for moving to Buffalo was not because my college friends are here or that there are more jobs to apply to, although those were major perks. I was becoming too comfortable in Ithaca. So many people stay in Ithaca forever, in this bubble of our liberal college-town, with the same annual events, with the same beautiful gorges, with the same people you pass by on your everyday outings. Staying in one place is definitely not a bad thing, but I’ve realized that I can’t live in a place that is always… the same. Ithaca is a beautiful place to visit and definitely to live in. And I do I have my friends, family and my favorite things to come back to. Trust me, I miss all of my favorite people and places, a lot… Oh, lets be honest, I miss my dog, Jack, the most. But I don’t want to live in the same. I’m 24 years old with so much ahead of me. I’ve realized that if I want to better my life, I need to start making the choices in order to do that. I can’t sit in what’s comfortable waiting for the opportunities to magically appear before my eyes. If I want something, I need to get it myself. I can’t live in comfort because it’s safe. I don’t want to live in what’s safe or comfortable. It’s not a life worth living, being comfortable and never embracing life changes or taking the opportunities that come our way. We don’t succeed when we stay safe. We succeed when we do something risky. When we push our own boundaries to the edge to see how far we can actually go is when success presents itself. The twenty-fourth book of my life is underway, and we’re almost through the second chapter. Right now, nothing can stop me and there’s no challenge that will defeat me.